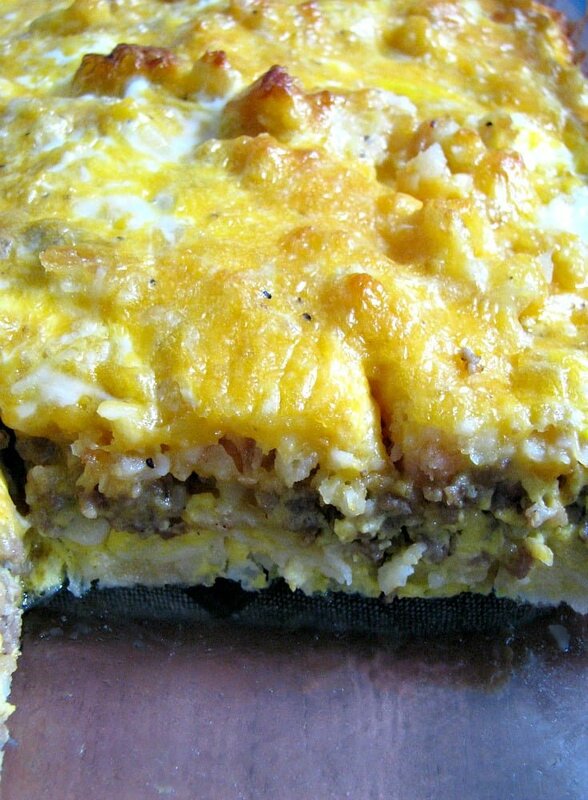 This cheesy Sausage Hashbrown Breakfast Casserole, made with frozen hashbrowns, bulk pork sausage, and your favorite cheese, is perfect for Christmas morning or Sunday brunch. This is my first new recipe in almost a month. I’ve been doing a lot of behind the scenes work, updating old recipes and photos, and added a new recipe card that gives you the option to change the serving size and amounts of ingredients needed for each updated and new recipe, along with nutritional information. It’s the nutritional information part that is taking the longest to do. If I’m going to have it available, I want it to be as accurate as possible, so that means a lot of research. 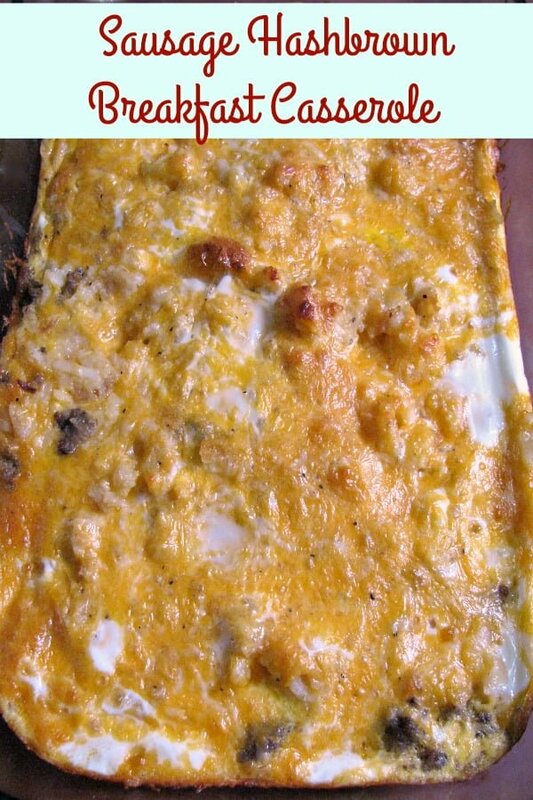 I still have a bunch of recipes to update, but that’s going to have to wait, because this Sausage Hashbrown Breakfast Casserole is perfect for Christmas morning and you need the recipe right now! Seriously, it’s so good! Originally, I wanted it to be a crispy hashbrown casserole, but I’m really impatient and didn’t take the time to make the hashbrowns in a single layer like you are supposed to. Don’t be like me, follow the directions on the bag! I used a Mexican cheese blend in this recipe. Cheddar would be great, too, or spice it up with habenero cheese if you want. Preheat the oven to 350 degrees F. Spray a large casserole dish with cooking spray. Heat a large frying pan over medium-high heat, add the sausage, breaking it up into small pieces. When the sausage is just starting to brown add the onion. Cook and stir until almost completely browned, adding the garlic in the last minute or two. When the sausage is completely browned, remove it from the pan to a plate, set aside. In the same frying pan, add half of the canola oil. Cook the hashbrowns in batches in a single layer according to the package directions until crispy. Add a thin layer of cooked hashbrowns to the casserole dish. Crack the eggs into a medium mixing bowl. Add the milk, salt, and pepper. Whisk until scrambled. 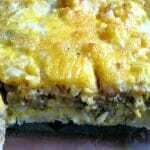 Top the layer of hashbrowns with the cooked sausage mixture, then layer the remaining hashbrowns on top of the sausage. 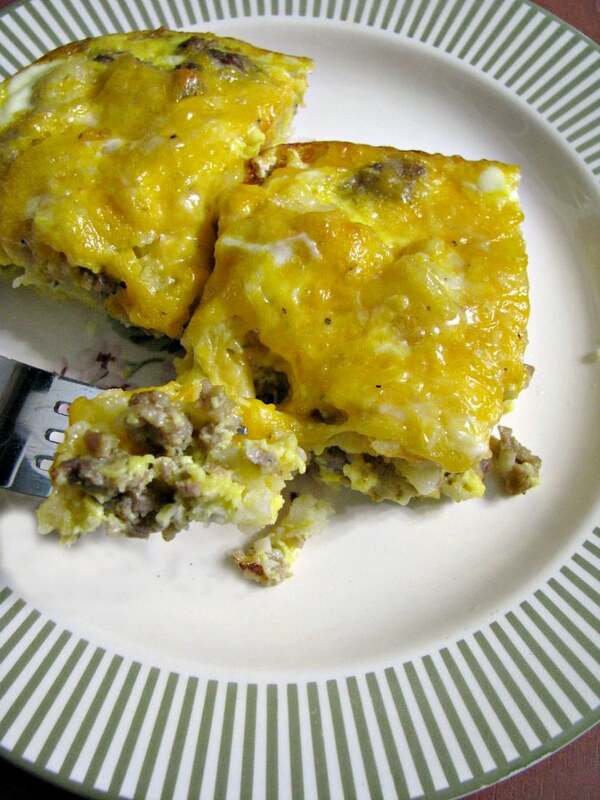 Pour the eggs over the casserole. Sprinkle the shredded cheese over the top. Bake, uncovered, in the preheated oven for 30 minutes or until the eggs are set. Let the casserole sit for 5 minutes before serving.